When your body doesn’t get all the nutrients it needs, it usually lets you know. Deficiency symptoms run the gamut from fatigue to confusion, a rapid heartbeat, insomnia, and gastrointestinal problems. If you’ve been wondering why you don’t feel well lately, be sure that you’re getting all the vitamins and minerals that you need every day for your body to function at normal levels. If your hair is dry and you’ve tried all the moisturizing shampoos and conditioners that you can think of, it’s time to consider that you might not be getting enough vitamin A. Vitamin A deficiency can cause not only dry hair but dry skin too. Maybe it’s not pre-Alzheimer’s that is settling in, after all. It could be that the reason you can’t remember where you put your purse or that you were supposed to be at the dentist three hours ago is because your levels of thiamin are dipping low. 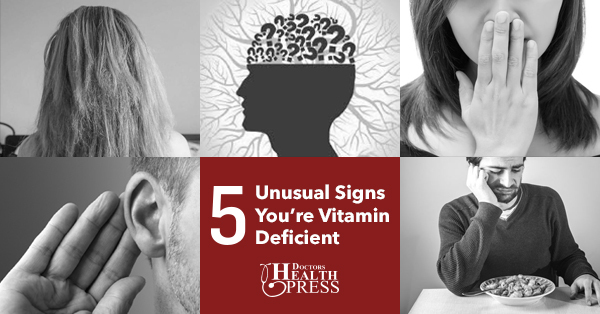 When you don’t get enough vitamin B1, your brain struggles to function at normal levels. You’ve been to the dentist and had all that nasty plaque removed. You brush your teeth diligently and you’ve even tried mouthwash, but somehow your breath is still not as sweet-smelling as you’d like. If you’re suffering from an unexplained case of halitosis, check to make sure you’re getting enough niacin in your diet. Niacin plays a role in the metabolism of carbohydrates, fats, and proteins. B3 is also needed for the production of hydrochloric acid. While it’s true that “selective” hearing can kick in as you get older, real hearing loss is no fun. If you’ve noticed that you can’t hear words spoken in the lower or higher vocal range and you’re starting to miss out on key points in a conversation, it might be time to boost your vitamin B6 levels. Vitamin B6 is a BIG player in your body, helping to perform a myriad of functions in your nervous system. A deficiency in B6 can lead to hearing problems, amongst other things. A loss of appetite may not seem like such a terrible thing for those who are trying to lose weight, but when the body doesn’t want to eat, something is wrong. You need a steady flow of healthy nutrients to stay healthy. When your body stops signaling to you to stop and eat, you can run into problems with your blood sugar and energy metabolism. If you’ve lost your appetite and you don’t know why, you could be low in vitamin D. Make sure you keep up your levels of this key vitamin by spending 15 minutes in the sun every day. If you can’t get enough vitamin D naturally, you will likely need to take a vitamin D supplement. Having a vitamin deficiency can make a difference in your health and well-being. If you start noticing any of these five signs, then make sure you’re getting enough vitamins—and look into taking supplements to fill in the gaps. “A Consumer’s Guide to the DRIs (dietary reference intakes),” Health Canada web site; www.hc-sc.gc.ca, last accessed June 19, 2013. “DRI Reference Intakes,” The National Agricultural Library web site; www.fnic.nal.usda.gov, last accessed June 19, 2013.